Midnight Bear was Donna Sharp's first attempt at a "lodge" bear quilt, and boy did she hit it out of the park with this one. Over many years she has created other bear and wilderness themed quilt designs, but Midnight Bear remains at the top for most customers. Donna Sharp uses many quilting techniques to create Midnight Bear, from regular patchwork, to applique. Midnight Bear features reds, yellows, blues, greens, black and cream in it's signature fabrics. Midnight Bear fabrics are hand cut and machine pieced and machine quilted. 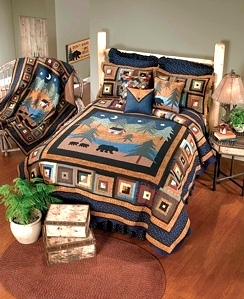 Like all Donna Sharp Quilts, Midnight Bear is a patchwork quilt, 100% cotton, oversized, and reversible.